Chickens – Off The Grid! 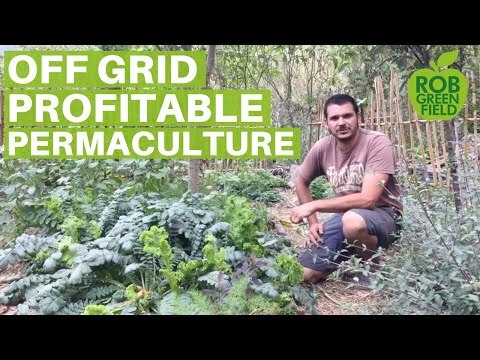 Greetings, I’m Shad coming at you from Lake Atitlán, Guatemala and today I am going to show you around our off the grid, zero waste, profitable, permaculture farm. One of the big ideas of permaculture is that we use nature as our guide and we mimic the natural patterns and in turn design eco-systems that can meet all of our needs. One of the big patterns that we can observe in nature is that nature produces no waste. There is no such thing as waste in nature because every output of one thing is used in-turn by something else continually adding to the diversity and complexity of the system. So that idea of producing no waste has been a central theme in the design of our own house and permaculture farm. Since the beginning of the farm we made the decision to be completely off the grid and aim to meet all of our energy needs as locally and sustainably as possible. For several years we lived without electricity and thoroughly enjoyed it but more recently we made the upgrade to a small solar system that consists of 3 90-watt panels and 2 batteries. I really want to stress here that going off the grid is not just about going out and buying a bunch of fancy equipment. Really it’s about looking deeply at our actual energy needs and devising strategies for how we can reduce our usage and consumption. Furthermore sustainability is a process and it is achieved only through work and accepting constant feedback. For example our cooking energy is still not 100% sustainable. We mainly use a rocket stove with firewood that we grow on the land but we also use a propane tank for a lot of our cooking. Our goal in the future is to build a biodigester that will produce methane and hopefully reduce our need for propane, but at the current moment we haven’t achieved that yet. Beyond our energy use all of our buildings as well are designed to feature locally available renewable materials. As with our house and other farm buildings the seed house here is a perfect example of a natural building made exclusively from materials we find on our land. >From the stone, to the bamboo, and soil all the way to the wood, these materials come from our land, and are readily renewed. Water is probably the most important element on any farm or homestead. Without water you can’t really do much of anything at all, and that is why when we picked our site and location we really prioritized access to clean potable water. Because of it’s importance we felt the need to develop 3 different resources at least that each provide us with clean drinking water. Right behind me is our spring and this is our primary source of drinking water. Aside from the spring we have a year-round river that provides all of our irrigation needs and filtered drinking water in an emergency. Finally we have rainwater systems that capture rainwater in a case one of the other elements does not work. Aside from working with actively flowing bodies of water, we also work with the passive harvesting of rainwater and other overland flow. The goal here as we see in nature is to slow the water down, spread it out across our landscape, and sink it into the ground. You can really remember that easily. Slow it, spread it, sink it. Even if you’re not living on an active profitable farm, it should be pretty easy for any person or family to meet most of their vegetable needs in a small space right behind their house. In permaculture we call the space surrounding the house that is visited the most “zone 1” and in zone 1 it is really quite easy to grow a whole lot of food to meet most of your vegetable needs. In this little garden right behind my house I have over 50 useful plants that are edible or medicinal. Visited regularly and watered regularly they grow very well even if they are packed in a little tight. By using companion planting and active care we produce all of our families vegetable needs in this 8 meter by 8 meter patch. A bit further away from the house we cultivate our main calorie crop, or energy crop. Which for us is taro root. The system in which we grow our taro root is in a forested system that mimics the naturally occurring architecture of woodlands and forests. If you look at any forest you can see that different plants occupy different layers. Starting from the bottom we have the root layer which for us is occupied by our main food crop, taro root. Beyond the root layer we have the ground cover layer which for us it sweet potato, or mint. The sweet potato provides edible greens as well as an edible root. Above the ground cover layer we have the herbaceous layer which for us is sweet cucumber, a shade tolerant fruit producing cucurbit, which gives a nice melon tasting fruit regularly. Above the herb layer we have naranjilla which is a small sour orange or we have banana. Beyond the herbaceous layer we go to the mid-sized or medium tree layer. In our food forests we grow loquats, pomegranates, limes, and tree tomatoes. These occupy the small tree layer, or the lower canopy. Above that layer we have the big trees or the upper canopy layer which for us is avocados and bamboo. Beyond that we have vines like passion fruit that grow all over the trees and produce a lot of fruit. We also have mushrooms growing which occupy an 8th layer in a naturally occurring forest. Together these plants provide a large amount of fruit that meets our fruit needs and keeps our diet exciting, but it really produces our taro root which is our major calorie crop. Another aspect of the food forest is that we rotate different types of animals through different parts of the farm at various times of the year. This allows the animals to fertilize the food forest and then allows the food forest to absorb the fertilization and rest when the animals move to a different piece. In this particular case we have meat birds that live in this movable chicken house behind us. This chicken house is easily rotated to connect to four different yards, and that allows the chickens to be in one yard for a period of time and then be moved to another place. Similarly goats which are the corner stone of our farming enterprise are rotated through pastures even further away from the house. By using people to guide their movements we move the goats throughout different areas so that the land can regenerate once they have been visited by the animals. Here we are in the market garden which aside from the goats accounts for the main income for the farm. The market garden mainly grows greens, herbs, and a variety of vegetables that we sell locally within our town and community. The market garden is managed with animals and with rotation of different types of crops. We move chickens or pigs through here regularly to help us turn the soil and weed out the bugs. We also rotate the different types of plants and ensure a wide variety of companion planting to ensure diversity, pest resistance, and insect attractance. Unlike the food forest which is relatively low labor, the market garden requires a lot of attention and care. All of our farm is 100% spray-free, we do not use any pesticides, not even organic ones. So that increases a our labor a bit that we need to cultivate annual crops for our market garden. Here we are in our pig and chicken house which is also our composting pile. It is the whole compost pile for the entire farm. Every amount of organic waste that we produce whether it is from our kitchen from our gardens, from the food forest, and even from the goat barn, all of that comes into this house. Below me is over 4 feet of actively composting deep bedding. If you dig down a little you will feel a lot of heat and below that is readily finished compost that you can apply anywhere to help your plants grow. By adding greens every day to the pigs and the chickens, plus their main food and a lot of kitchen and restaurant scraps we ensure that they have a high quality diet, lots of green material in their diet they get air flow, sun, and lots of exercise. Most importantly is that they get food and nutrition from the compost pile and they are our primary turners so they do all of the work while producing eggs and compost. Well maybe not all of our organic waste goes to the chicken house, right here behind me is our composting toilet. Which allows us to convert our human waste into a rich natural resource which is fertilizer for our fruit trees. Since we began we always had the idea that it’s not really good for our waste to become someone else’s problem. When you flush a toilet your poop goes away from your land and becomes someone else’s troubles. Similarly any plastic that we find or that we produce we don’t let it leave our land. Instead we stuff it in old water bottles and that turns our waste into a resource. These eco-bricks can be used to make garden beds, or benches, or walls. For me that’s really what off the grid and zero waste is all about. It’s about looking at things differently and seeing how you can convert waste into resources. So speaking of resources I think I will go convert some right now. If you guys want more information about our permaculture farm, check out www.facebook.com/AtitlanOrganics Happy Pooping! www.AtitlanOrganics.com www.Facebook.com/AtitlanOrganics Video by Rob Greenfield www.RobGreenfield.tv Subtitles by the Amara.org community.